There’s something alluring about seeking out the lesser-known, the hidden gems, experiencing things that often elude the guidebooks and mainstream travel discourse – indeed, it’s this kind of curiosity that inspires our daily free walking tours in Berlin, as we offer authentic insight to the city’s culture, history and character as well as the lesser-known stories and sights; but, beyond the Berlin city map there’s a whole host of places worthy of discovery and exploration that you might not have even thought about visiting when planning your Berlin adventure. Just a few hours from Berlin, by train, bus or car, you can find yourself in totally different surroundings, or indeed a different country altogether. If you have an extended stay in Berlin and fancy getting on the road less-travelled, here’s our top six places for a day or weekend trip from Berlin. The City of Seven Spires, Lübeck is a beautiful port city in Northern Germany on the river Trave which circles the metropolis before flowing into the Baltic sea. It is a medieval city steeped in fascinating history and is a treat for any urban explorer who revels in narrow side-streets and mysterious alleys leading to quaint courtyards. 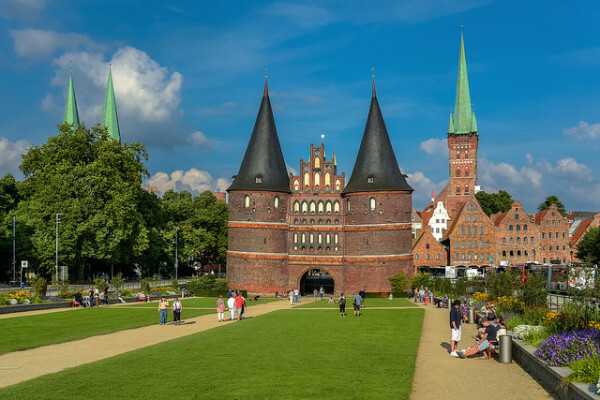 Despite suffering a bombing raid in 1942, the ancient character of Lübeck is largely intact today with fantastic examples of Gothic, Renaissance and medieval art and architecture on display throughout – particularly in Altstadt, the Old town which is Germany’s largest historic centre. Guarded by the iconic Holstentor, the beautifully ornamented 15th Century Brick Gothic gate, the Old town is home to many Renaissance houses and middle-age guildhalls, as well as the incredibly impressive 13th century Marienkirche church. 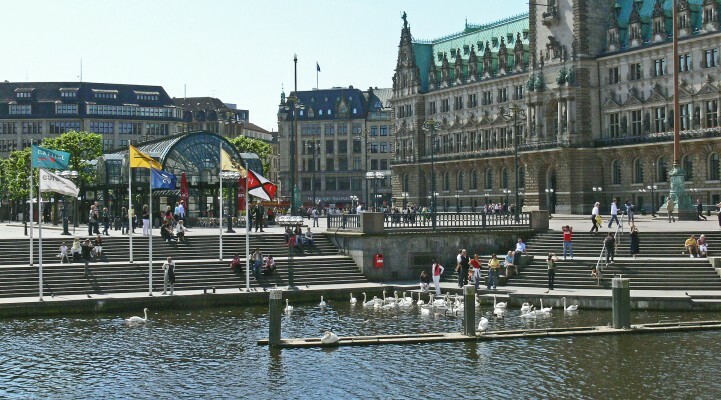 After a day of meandering through passageways and courtyards, being mesmerised by the elegant architecture and character of the city, along the An der Obertrave promenade is the ideal place to sit at a café, restaurant or bar terrace and enjoy a relaxing drink on the bank of the river. This is truly one of the nicest places to visit near Berlin. Only about an hour or so by train from Berlin, in the rural Brandenburg region, there is a place that promises all the joys of unspoiled nature - wild forest, calm canals and secluded beaches. 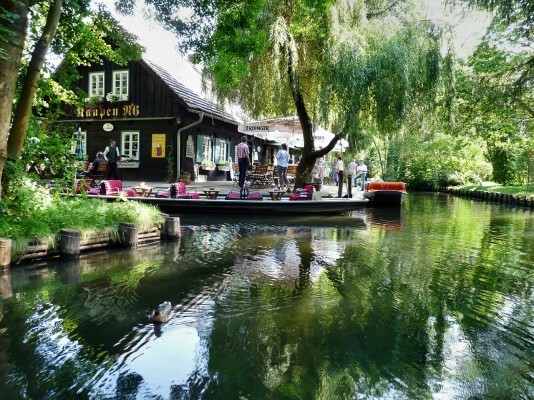 That place is Spreewald and, while it is popular among locals on day trips from Berlin or a weekend retreat, it is possible to avoid the touristy vibe and enjoy some relaxing ‘me time’ in beautifully scenic surrounds too. You can avail of group boat tours and private boat tours along the canals if you prefer not having to think too much about where you’re going, but you can also rent your own individual kayak or canoe which is a perfect way for solo travellers, couples, or small groups to really make the most of their time in this blissful setting. The canal route is dotted with delightfully quaint towns & villages and places to stop for a coffee, beer, or the tasty pickles that the region is particularly famous for. Lübbenau is a good example of one such town, but if you venture further, beyond the village of Ledhe, you’ll notice a much more serene and secluded environment, less touristy and naturally picturesque. If you’re seeking a respite from bustling Berlin, this UNESCO recognised rural retreat is the perfect place to find it! Don’t be fooled by the name, you’re still in Germany; in Saxony near Dresden to be more precise. 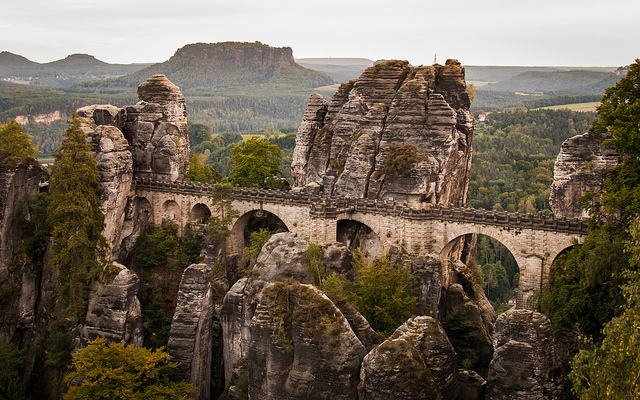 This national park is a vast expanse of nature in the heart of the German part of the Elbe Sandstone Mountains and is dominated by dense forest punctuated with rocky peaks, canyons and valleys. Despite being largely an area of unspoiled nature, there are plenty of attractions and things to do here, attractive towns such as Bad Schandau and Pirna, and several splendid spas and hotels (if you prefer not to camp out in the permitted camping zones) making it an ideal destination for unique weekend trips from Berlin. You can enjoy the many walking trails, hiking opportunities, and even join available walking and hiking trail tours. If you’re seeking something more adventurous, you can even climb some of the 700 peaks in the park. The main attractions in Saxon Switzerland National Park are, arguably, the Bastei bridge – a 200m high sandstone bridge connecting sublime rock formations and affording incredible views of the surrounding scenery, and Königstein Fortress – a former state prison, the largest hilltop fortification in Europe, which overlooks Königstein town. This time we really are leaving Germany. Only about four hours by train or bus from Berlin, you can experience a whole different country, culture, character and cuisine in the Czech Republic. 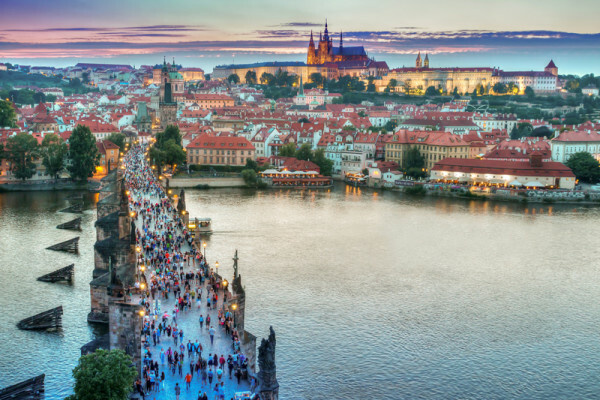 The capital, Prague, is an absolutely gorgeous city full of history and fascinating sights such as the beautiful Charles Bridge, Old Town square, Medieval Astronomical clock and the incredible 9th century Prague castle complex. So, if you’ve had your fill of Berlin and fancy something different for a couple of days, why not tick another nation off the bucket list while you’re so close?! While the Germans, particularly in Bavaria, are well-known for their beers and pride in their brews, the Czechs surpass them as, officially, the biggest beer drinkers in the world - and Prague is steeped in beer brewing history and culture. We recently launched an excellent craft beer tour in Prague which takes you on a delicious journey through the different styles & flavours of local beers, and the history, culture and science behind them. You visit three traditional pubs with our local expert beer guide, enjoy 11 beer tasting samples, and food is included too – it’s a perfect way to spend an afternoon in Prague but if you prefer to explore and have a couple of beers at your own pace, there is lots of traditional beer halls and bars to indulge your craving for some of the world’s best beers. 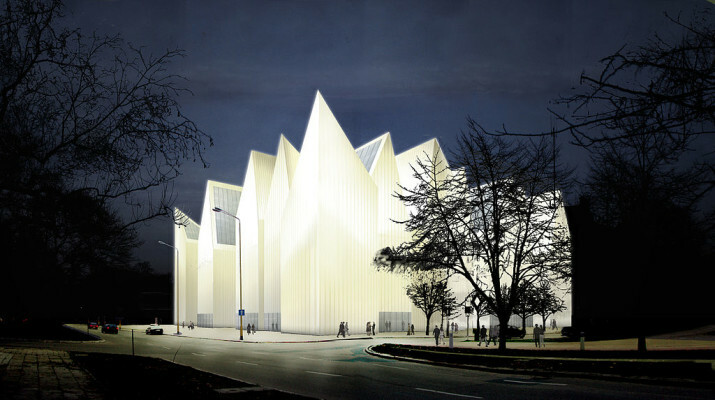 Another cross-border recommendation now; you can be in Szczecin in Poland, from Berlin, in under two hours by bus or train. Szczecin is a wonderful mix of architectural styles – from the Renaissance elements of the Castle for the Dukes of Pomerania and the Haussmann-style of the city’s avenues, to the award-winning contemporary architecture of the utterly unique Szczecin Philharmonic concert hall, you will be treated to some of the most intriguing buildings and designs in Europe. There’s more than attractive architecture to allure the curious traveller in Szczecin though; you can venture deep underground, 17 meters in fact, into 19th catacombs that were twice re-purposed as safe refuge from conflict – first during the bombing raids of WWII and as a nuclear bunker during the Cold War era. Today you can take an hour-long tour dedicated to either the WWII or Cold War period and see reconstructed living quarters from each time. It’s quite a fascinating experience and one you shouldn’t miss if you take the trip. Back on German soil now, and the second largest city – Hamburg. It makes our list because, despite being another large urban metropolis, Hamburg is quite different to Berlin in many ways, and so is worth a trip for a different kind of German experience. With more bridges than any other city in the world, the ‘Venice of the North’ moniker doesn’t go quite far enough in impressing how central the canals and rivers are to the character of this wonderful maritime city by the seas. Waterways are so inherent to daily life here that ferries are as common-place as the buses and metro for getting around this exquisitely beautiful and culturally rich city. While it boasts a similar offering to Berlin in terms of nightlife, culture, shopping, vibe and a healthy dose of alternative & sub-cultures, Hamburg just feels more ‘consistent’ and accessible in the sense that, rather than being a series of diverse districts, there’s a bustling ‘centre’ to Hamburg – a central core at the heart of which is Alster lake, vibrant cafes, and the pretty Jungfernstieg boulevard almost seamlessly connecting the Old Town with New. The city emanates from here, stretching with fantastic architecture, style and history the whole way out to its fringes. And that’s your lot, dear traveller, our six recommendations for a weekend trip from Berlin. Each offers something different and something special, are easily accessible, and relatively cheap to get to, by bus or train from Berlin. So, if you’re planning a Berlin adventure, why not pencil in a day or two to extend your escapade beyond Berlin’s borders and enhance the experience with a jaunt to one or more of these beautiful destinations? !